Kim Collier runs a Salina home-leasing agency and went through offender-victim mediation after one of her rental houses was vandalized. In hopes of keeping “teen stupid” from becoming a worse label, juvenile justice reform in Kansas aims to build better kids and better communities. But how? A closer look at restorative justice and how it’s being explored amid a broader push. In a conference room in downtown McPherson, six people come together to talk through why a teen offender did something dumb, the effects of that decision and what can be done to make it right for the crime victim and for the community. She’s talked to the victim, and he doesn’t want to take part, so the three members of a Neighborhood Accountability Board are taking his place, serving as a combination of victim and community representative. They and Loganbill are joined by the teen, his father and a board trainee. The rules are simple: One person talks at a time. Be respectful. Be honest. Listen. It’s a confidential process, which is why details of the crime are omitted here. Let’s just say the young man made good on an impulse to steal something. So began his contact with the legal system. But in this case, the goal is to see justice done and the victim and community “made whole” – with apologies and restitution or community service – without tagging the offender as a criminal. “If we label them a criminal, then it’s likely they’re going to continue on the wrong path,” Loganbill, a retired high school teacher, explains in an interview. The McPherson immediate intervention program, launched in summer 2017, and an older one in Salina are based on the tenets of restorative justice, utilizing mediation and emphasizing reconciliation between victim and offender. It’s just one of the approaches that communities across the state are exploring in the wake of the 2016 passage of juvenile justice reform. That law has allowed a variety of experimentation, with goals of reducing out-of-home placement by more than 60 percent and saving the state as much as $81 million over five years. The approaches, aimed at low-risk juvenile offenders, include efforts attacking truancy and substance abuse, mentoring and education, anger management, family counseling and more. All proceed from research and common beliefs driving the Kansas reforms: Too many kids, especially first offenders, were spending time in costly out-of-home detention and would be better served by a supportive rather than a punitive approach. When judges put low-level young offenders – shoplifters, vandals, school fighters, minor drug offenders, largely kids guilty of “teenage stupid” as one ex-prosecutor called it – in facilities with higher-risk youths or even adults, they can come out worse than they went in. Under the new approach, the Kansas Department of Corrections awards grants in each Kansas judicial district. They can go to community organizations such as Newton-based Offender/Victim Ministries but also to government-affiliated entities. There are 31 judicial districts with different programs and different approaches. There’s a lot to be sorted out and analyzed under the broader measures of reducing detention, curtailing repeat offenses and keeping kids near home and in school. “What we’re talking about with this reform is massive change. It’s not just a change of how we do things, but a change of how we think about doing things. For a lot of people, that level of change is really, really difficult,” says Megan Milner, director of community-based programs for the Kansas Department of Corrections. While many evidence-based reform approaches focus on the offender and the offender’s behaviors, restorative justice has a wider lens: It seeks to not only hold the offender accountable but also tries to repair harm to the victim and community, as well as help the offender. Thea Nietfeld, director of community and restorative justice at Offender/Victim Ministries in Newton, says restorative justice takes a more systemic approach because it involves collaboration among all three parties. She says the approach not only reduces recidivism but also can offer some degree of satisfaction to victims and provide youth with skills to avoid violent conflict in the future. But it’s also a way of looking at things that expands beyond traditional definitions of administering justice, which creates challenges. “So, it takes a (prosecuting) attorney who is a systemic thinker and who is willing to empower constituents outside conventional law enforcement to engage,” Nietfeld says. It’s also a return to the spirit of late 19th centuryreforms that resulted in the establishment of juvenile courts. Prior to that, juveniles and adults were largely treated the same in criminal court. Those juvenile courts operated largely as intended until the mid-20th century. Then the pendulum began to swing back, and the ideals of the early reformers became overshadowed by a movement to assert juvenile rights. That had the effect of returning the process to one in which juveniles and adults got similar treatment before the bench. For supporters of restorative justice, the current situation is both an opportunity and a challenge. Advocates have a chance to prove that their nontraditional approach can make a difference within several counties in the state. But if the goal is for restorative justice to become more widespread across Kansas, it remains to be seen whether the approach can stand out among all the alternatives being explored. When someone smashes windows, tears up Christmas lights or steals a car, people want justice, even vengeance – and that can include victims, police, prosecutors, most anyone. And much of the legal system is designed to punish. It’s what people are used to. Kansas likes to see itself – and, really, what state doesn’t? – as a law-and-order state. So sending a kid to mediation, to family or substance abuse counseling, or to earn a GED instead of sending them to detention challenges beliefs and even how people view their jobs. But because the underlying issue driving reform was a belief that old methods weren’t working, reform advocates found a sympathetic audience for research showing that nontraditional methods offered promise. The inadequacy of the state’s previous approach to juvenile justice drove John Rubin, a former Shawnee state representative and self-describedconservative Republican, when he was chairman of the House Corrections and Juvenile Justice Committee. A former federal administrative law judge, he served on a juvenile justice working group that included fellow lawmakers, the state’s chief justice, representatives from agencies, prosecutors and defense attorneys. The instinct to impose punishment might be ingrained in the system, but advocates of reform didn’t think it was doing much to make the state safer. Rubin says that focusing on the evidence – that Kansas lagged other states in its approach and was getting less for its money – helped build the case and gain the votes for passage of the reforms. The legislation ended up passing unanimously in the Senate and 118-5 in the House. Still, he and other advocates would be accused of being soft on crime. One district attorney called it a “hug-a-thug” approach. have high-risk offenders,” says Rubin, outlining his counterargument. But alternatives to an established routine tend to challenge society’s default thinking about what justice looks like, and restorative justice may face a climb in gaining public acceptance as steep as any of the approaches being tested in Kansas right now. Restorative justice has few vocal opponents in Kansas – something that could be just as easily explained by its success as by its relatively small scale currently. Nationally, though, it does have critics and skeptics, particularly when it’s been tried as an alternative discipline method in schools. Karen Loganbill, a retired high school teacher, is a facilitator for the McPherson immediate intervention program. Restorative justice is typically used in less serious cases, such property crimes as theft, where it’s easier for victims to be made whole. In more serious cases, efforts at restorative justice can generate backlash, and some critics contend that its use in incidents such as domestic violence cases may set up victims to be abused again. Other critics tout restorative justice’s potential to offer alternatives to juvenile incarceration but say it doesn’t go far enough in moving the criminal justice system away from mass imprisonment of offenders. Those who’ve seen restorative justice put into practice for juveniles in Kansas, however, often report positive experiences. Leslie Frye, the McPherson program director, and others say they’ve generally found officials in the legal and juvenile justice systems and the community supportive, though it can be hard to guess reactions. It’s not like kids get off scot-free. County and district attorneys retain the power to choose which cases go to intervention, counseling or some other approach. Cases can be kicked back to corrections and the prosecutor if the approach doesn’t work. “A lot of the agreements worked out in our joint sessions are more demanding of the offender than what might have occurred in court,” says Murphey. Keeping law officers and others in the legal system apprised has curbed some skepticism. “We will send them a synopsis of the agreement, so that they will know that something was done for the kid they arrested,” Murphey says. “That has been transformative, as they see that the offender would have to do more with (restorative justice) than they ever would have in court. And if there’s community service involved, well then thecommunity benefited because this happened. “It switches criminal justice from an impersonal and very formal process that’s aimed at a person by force, by the state, the government, and switches that — here’s the kumbaya part — into a community healing process so the community can repair itself in a natural way from the break that occurred,” says Ault-Duell, who heads the community advisory board for the Salina Initiative for Restorative Justice. The process of building the support and infrastructure necessary for restorative justice approaches to be used in Kansas has required leadership, especially working across factions. 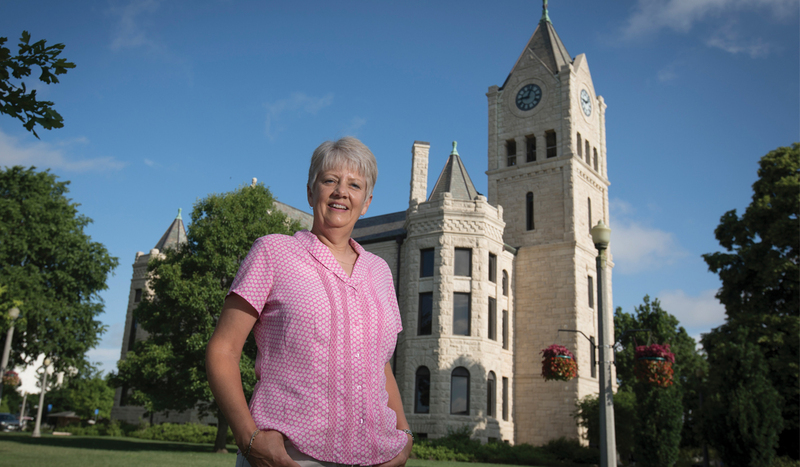 Nietfeld, who attended Kansas Leadership Center programs in 2014 and 2015, was at the heart of getting the McPherson program and the older Salina program off the ground. A Unitarian minister, mediator and believer in mending harms instead of just punishing culprits, she is now director of community justice programming for Offender/Victim Ministries. 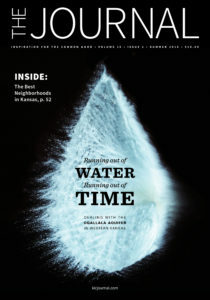 As the major changes – systemic and philosophical – of Kansas juvenile justice reform came to be a reality, Nietfeld and Cagle, the community corrections director, connected. They discussed ways to create a juvenile immediate intervention program and who should be in on the discussion. “We did not have that resource, a parent-adolescent mediation. We didn’t have an offender-victim reconciliation program. We didn’t have any of the restorative justice pieces within the community,” says Cagle, noting that Offender/Victim Ministries had similar experience in the 9th Judicial District’s other county, Harvey. 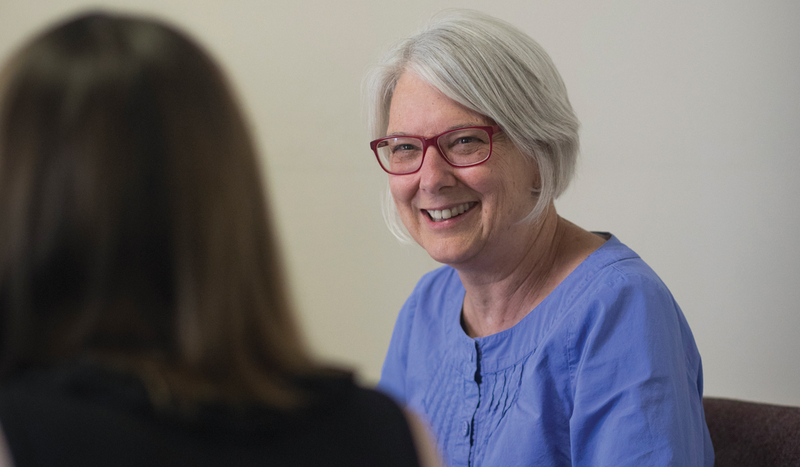 Nietfeld reached out into the community and found a sympathetic home for the discussions at Circles of McPherson, a faith-based anti-poverty program that provides education and support to help families improve their lives and income. The program got running in summer 2017 thanks to grants and assistance from the McPherson Community Foundation, a private donor and others, allowing it to start work then instead of waiting for state grants to be issued this year. Now, the program has 15 volunteers, many of them former teachers or others who “know what it’s like when vulnerable kids don’t get the support that they need,” says Frye, its only employee and quarter-time, at that. In the second half of last year, 25 cases were referred to the program – officially the McPherson County Restorative Immediate Intervention Program – by the local Community Corrections office. Doing things better – and cheaper – is what juvenile justice reform is all about. And one of the driving forces of change is investing a lot of the power for making decisions locally. Milner, the community-based programs director for the state Department of Corrections, works with judicial districts and with community programs and the grants that fund them. The grants, totaling more than $3.5 million across the state, were announced in January. The approaches vary but must be evidence-based, with regular reporting on such measures as whether kids remained at home, stayed in school or were working, or had been arrested again. The approach is designed to give local communities a say – programs must be endorsed by a judicial district’s corrections office and sanctioned by the county commission – in what their youth and offenders need. In a sense, it’s also designed to encourage innovation across the state and see what works best. In some districts, especially in rural areas where resources are slim and distances long, figuring out how to best serve kids has been challenging. In the 15th Judicial District covering seven northwest counties, discussions led to the conclusion that sending a substance abuse counselor into homes for sessions could work better than arranging group sessions in the far-flung district, Milner says. But pushing so much to the local level can add complexity. Resources are limited, and different approaches can be received very differently depending on the county. For instance, the volunteer-driven Salina Initiative for Restorative Justice did not receive the grant for the 28th Judicial District, which instead went to another organization providing youth and family counseling and other services. The initiative has been encouraged to reapply, but the decision illustrates how much of what is getting tried depends on local circumstances. The receptiveness of key local stakeholders, whether it’s the police or prosecutor, to restorative justice as an alternative approach to juvenile justice varies widely. Even in places where there’s substantial support, it may not even be the preferred method being practiced. Yet even without that grant, Salina’s restorative justice effort continues to unfold. Like Offender/Victim Ministries, the Salina program depends on grants, donations and the small fees it charges offenders – on a sliding scale – to go through the process. It is doing work in nearby Dickinson County and is continuing to get cases from the county attorney. What the reforms have changed is that the cases are immediate interventions – meaning they were routed to the programs before a youth was ever charged. If prosecutors can be persuaded to support that approach, it does pay dividends, Ault-Duell says. The first case he sent to the Salina program as a prosecutor involved four or five youth vandals. If it had gone to court, there would have beena bunch of co-defendants, each with his own case and lawyer. Clearly, though, authorities don’t see restorative justice as the right approach for every situation. In some parts of the state, it’s barely even on the radar screen. And the higher its profile becomes, the more likely it is to generate discussion, and perhaps even controversy. The tendency to want to impose punishment rather than encourage reconciliation is quite real. In some cases, victims may very much prefer the former to the latter because they are reluctant to forgive someone who has victimized them. However, for other victims, there’s a lot of power in being heard. And in better understanding the circumstances involved. Kim Collier runs a Salina home-leasing agency and went through victim-offender mediation after youths vandalized a rental house. The other powerful piece, she says, is “being able to listen to some of the things that happened in their school or home life, about a loss or about the parental figures in their lives.” That helped guide suggestions for a resolution, such as volunteering at a food bank or getting mentoring instead of making financial restitution. If the programs can show satisfactory results over time, then they’re likely to take root in more communities. In McPherson, a Neighborhood Accountability Board, or a face-to-face meeting between a perpetrator and a crime victim, involves five key questions. The process likely sounds familiar to anyone who knows his or her way around leadership principles: diagnose situation, manage self, energize others, intervene skillfully. What do you think needs to happen to make it right? Thea Neitfeld, Offender Victim ministries, operator of programs in McPherson and the Newton office, meets with one of the program’s former clients. Not pictured is Leslie Frye, the McPherson program director. If the victim wants to take part directly, a victim-offender conference is held, a face-to-face meeting to revisit those questions and come up with a plan to resolve the issue. If the victim declines to participate or is unavailable – a business might not want to take the time for a minor shoplifting case, for example – then the case goes the Neighborhood Accountability Board route. Then a date is set to go over the case, sometimes not an easy thing to pull off when dealing with teens and their work schedules, hesitancy and the occasional lack of forward thinking. On the second try, this one in McPherson has come together and participants are running through the questions with the teen offender. In one recent board session, a teen offender admitted that his theft hurt the owner of the property but also his own father – who lost a friend. Paying a fair amount for the stolen item would help make things right, and so would a letter of apology. “I’d have to save up for a couple months, but I can make it happen,” says the young man, whose knee bounces nervously early in the questioning but whose comfort level seems to grow as the process rolls on. For reference, facilitator Karen Loganbill researched how much the stolen item might be worth. There’s a lot of back and forth as they discuss realistic time frames and amounts because, they agree, his earnings can only stretch so far and “we don’t want to set him up to fail.” The talk isn’t limited to just dollars and payment plans. It also involves finishing up the hours needed for his high school diploma and how his employer will likely accommodate schedule shifts, because he’s a dependable worker. Loganbill writes down the terms, setting out installment payment dates and a letter of apology – “That’s equally important as the money,” board member Flo Peterson says – as well as steps for completing initial work on his diploma. “You’re going to be a busy boy,” says board member Chery Pauls. “Your willingness to take responsibility says a lot,” Loganbill tells him. They’ll keep the agreement on file while its terms are being met, then forward it to the county attorney and Community Corrections once it’s been fulfilled. Then, the young man will be record-free and done with the legal system. “We’re rooting for you,” several board members say. This entry was posted in Judiciary, Juvenile Justice and tagged justice, juvenile. Bookmark the permalink.